This tweet came only one day after he threatened to “devastate Turkey economically if they hit Kurds,” and a day before Daesh killed 20 people, including four Americans, in the Syrian city of Manbij. The tweet is reminiscent of one posted by Trump two years ago. “I’ll absolutely do safe zones in Syria for the people,” he tweeted on Jan. 25, 2017. The scope of the two safe zones, then and now, is slightly different. In 2017, it was mainly aimed at resettling Syrian refugees. 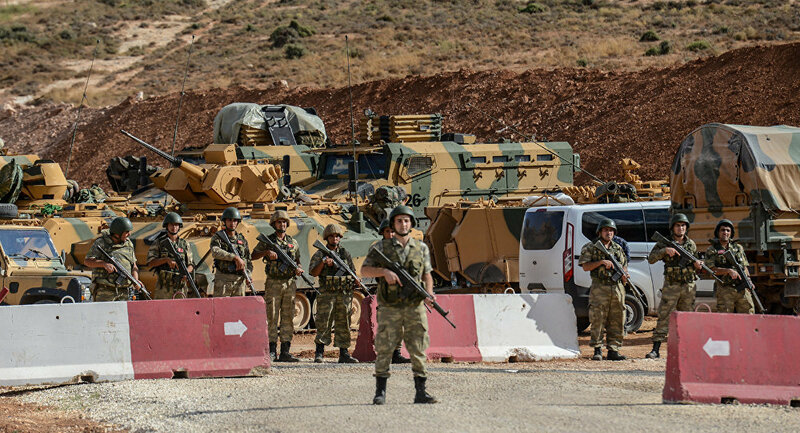 Now the scope has shifted to protecting the Kurds from Turkey. Also, Turkey’s perception of a safe zone differs from that of the US. What Ankara has in mind is closer to what Trump was contemplating in 2017. After Trump and Erdogan agreed last week to create a safe zone, the latter gave additional details. He said a 32-km belt would be created, and it could be extended if necessary. He then suggested that after the safe zone is created, two-story houses with a 500-square-meter garden could be built for each family by Turkey’s government-owned mass housing authority. Devlet Bahceli, the leader of the Turkish far-right Nationalist Movement Party, cited a catalogue of prerequisites for the creation of such a zone, including that it has to be entirely under Turkish control, and that the borders, the timing of its implementation and its governing rules must be determined by Ankara. He said if these conditions are not met, the safe zone will become a failure for Turkey. Erdogan cannot easily disregard Bahceli’s prerequisites in the run up to Turkish municipal elections on March 31. Erdogan and Putin will have to work hard to iron out the question of the preservation of Syria’s territorial integrity and sovereignty. Last week, the US dispatched Sen. Lindsey Graham to Turkey to appease Ankara’s disillusionment about Washington’s policy on Syrian Kurds. He said he was on a mission to ensure that the US withdrawal announced by Trump in December does not cause greater damage. To withdraw and leave Kurdish fighters with weapons supplied by the US was “insane,” he said. Turkey will wait to see whether Graham’s promises will be fulfilled. There are many other hurdles to creating a safe zone. The most important one is that it needs a UN Security Council resolution. Russia, as a permanent council member, has the right to veto any resolution that infringes its red lines. Moscow has persistently underlined the importance of the preservation of Syria’s territorial integrity and sovereignty. Therefore, big efforts will be needed to close the gap between the Russian, American and Turkish positions. Russian Foreign Minister Sergei Lavrov said Moscow plans to coordinate with the US and will take into account the security interests of all countries in the region, including Turkey. Another hurdle is the attitude of Syrian Kurds, who regard the safe zone as offering protection from the Turkish military. Russia may not be able to meet all of Turkey’s prerequisites, but it will try to fulfil them as much as possible. Erdogan is expected to meet with Russian President Vladimir Putin on Jan. 23. The agenda of their meeting will be dominated by the safe zone, because the threat that Turkey perceives from the Syrian-Kurdish People’s Protection Units (YPG) is perhaps more important for it than any other subject. Syria’s Idlib province is a less important item on the agenda. Erdogan and Putin will have to work hard to iron out the question of the preservation of Syria’s territorial integrity and sovereignty. This principle has been reconfirmed several times by the guarantors of the Astana/Sochi process: Russia, Iran and Turkey. Tehran may also be putting pressure on Moscow to preserve Syria’s sovereignty. The building of houses for displaced people or returnees may also be on the agenda, but the more fundamental question of the feasibility of the safe zone has to be sorted out first. Ankara’s position on creating a zone controlled by it is unacceptable to Damascus. This again raises the need for cooperation between Turkey and Syria.